A 19-year-old male reported with the complaint of a fractured upper front tooth following a sports injury 1 year back. A tooth-colored composite restoration was done 1 week after the trauma at a private operatory, which broke 4 months later. Clinical examination revealed an oblique Ellis' and Davey's Class II fracture of the maxillary left central incisor and less than 1 mm of overjet and overbite between the arches [Figure 1]a. Vitality tests (thermal pulp tests, electric pulp test, test cavity) and radiographic examination were carried out. The traumatized tooth was diagnosed as nonvital and root canal treatment was advised. Based on the patient's esthetic requirement, considerations of remaining coronal tooth structure and occlusion, a decision of post endodontic restoration with a CAD/CAM fabricated single-unit all-ceramic post-core-crown was reached. Informed consent of the patient was obtained after the nature of the procedure and possible discomforts and risks had been explained. Figure 1: Case Report 1. (a) Preoperative intraoral picture: Ellis' and Davey's Class II fracture of maxillary left central incisor with inadequate overjet and overbite, (b) Preparation of maxillary left central incisor for single-unit all-ceramic post-core-crown restoration, (c) Computer-aided designing and computer-aided manufacturing software designed three-dimensional image of zirconia ceramic restoration, (d) Postoperative view of cemented restoration, (e) Periapical radiograph following cementation of single-unit all-ceramic restoration. Root canal treatment was performed under rubber dam isolation. Cleaning and shaping of the canal was done to size 60 K-file accompanied by copious irrigation with 2.5% sodium hypochlorite (Novo Dental Products, Mumbai, India) and obturation was done with gutta-percha and AH-Plus sealer (Dentsply DeTrey, Konstanz, Germany) by lateral condensation technique. Gutta-percha was removed with a heated endodontic condenser and post space prepared using Peeso Reamers sizes 1 to 4 while ensuring 5 mm of remaining apical gutta-percha for adequate apical seal. Shade matching for ceramic restoration was done (Vitapan Classical Shade Guide, VITA Zahnfabric, Bad Sackingen, Germany) and tooth preparation carried out, as for an all-ceramic jacket crown with a radial shoulder finish line of 1 mm width and rounded internal line angles [Figure 1]b. A two-step putty wash polyvinylsiloxane impression of the post space was made (Aquasil Soft Putty/Regular Set Impression material, Dentsply DeTrey, Konstanz, Germany). The impression was poured with CAM-Stone N (Siladent, Goslar, Germany) for accurate opto-electronic scanning and digital impressions were made. A three-dimensional reconstruction of the preparation was done using the CEREC InLab 3D software 3.03 (Sirona Dental Systems Inc, New York, USA) providing for a 1-mm reduction of the milled prosthesis on the labial surface and incisal third of palatal surface [Figure 1]c for veneering ceramics. The zirconia coping was then milled from a Y-TZP machinable ceramic ingot (IPS e.max ZirCAD, Ivoclar Vivadent, Schaan, Liechtenstein) and sintered for 8 hours at 1500°C. The milled unit was veneered on the labial and incisal third of palatal surfaces with a sintered fluorapatite glass ceramic (IPS e.max Ceram, Ivoclar Vivadent, Schaan, Liechtenstein) to give it a lifelike appearance. The finished restoration was evaluated for fit, shade, and occlusion prior to cementation, gingival retraction cord placed, and the restoration luted with a dual cure composite luting agent (Variolink, Ivoclar/Vivadent, Schaan/Liechtenstein). The excess luting agent was removed with a scalpel and all accessible margins were finished using fine diamonds and polished with rubber points and diamond polishing paste. The cemented restoration was evaluated clinically [Figure 1]d and radiographically [Figure 1]e and appeared to give good esthetic and functional results. A 31-year-old female patient presented with a complaint of severe pain in the upper front teeth since 1 week. The pain was pricking, sharp shooting, and spontaneous. The patient gave history of trauma 9 years ago with two to three previous episodes of intermittent severe pain and swelling, which subsided on medication with analgesics and antibiotics. Clinical examination revealed an Ellis' and Davey's Class III horizontal fracture of the maxillary left central incisor. Both central incisors were discolored and the related labial mucosa was tender on palpation. The central incisors and the left lateral incisor were also tender on percussion. Examination of occlusion revealed a decreased overjet and overbite. Both central incisors and the right lateral incisor tested nonvital and radiographic examination revealed a fracture line involving pulp in the upper left central incisor with a diffuse periapical radiolucency of size approximately 1 cm diameter, involving the roots of the maxillary left central and lateral incisors. Root canal treatment was thus indicated for the maxillary central incisors and right lateral incisor. The upper right central incisor was planned to be restored with a heat-pressed glass ceramic jacket crown, whereas the fractured upper left central incisor was to be restored with a single-unit all-ceramic post-core-crown restoration. Root canal treatment was carried out for all three teeth as described in Case Report 1. The teeth were irrigated with 2% chlorhexidine and calcium hydroxide was placed as intracanal medicament for a period of 3 weeks. Once the drainage from the canals ceased and patient was asymptomatic, obturation of the root canals was carried out with gutta-percha and AH-plus resin sealer by lateral condensation technique. After 2 weeks, post space preparation was carried out for the upper left central incisor and tooth preparation was done for both central incisors for all-ceramic jacket crowns. Subsequent impression and CAD/CAM fabrication procedures for the restorations were similar to those described previously. For the upper right central incisor, a heat-pressed glass ceramic crown was prepared. At the cementation appointment, both finished restorations were tried for fit, shade matching, occlusion, and insertion sequence. The cementation protocol followed was similar to that described in Case Report 1. The cementation procedure for the glass ceramic crown on right central incisor involved the additional steps of conditioning of bonded surface with 9.5% hydrofluoric acid (Porcelain Etch, Ultradent Products, Utah, USA) followed by application of silanizing agent (Monobond S, Ivoclar Vivadent, Schaan, Liechtenstein). Patient was extremely satisfied with the excellent esthetics achieved with the all-ceramic restorations and the complete resolution of her long-standing problem. Anterior teeth that have been severely compromised by caries or trauma have been traditionally restored with cast metal dowel-cores with porcelain fused to metal (PFM) crowns. In light of the increasing demand for improved esthetics and better patient awareness, all-ceramic systems have gained popularity. The high-strength ceramics allow fabrication of restorations with optimal esthetics, good biocompatibility, excellent periodontal tissue response, as well as the necessary mechanical properties to withstand functional stresses. The improved potential of these ceramics to bond to enamel and dentin has made metal-free restorations a clinical reality. 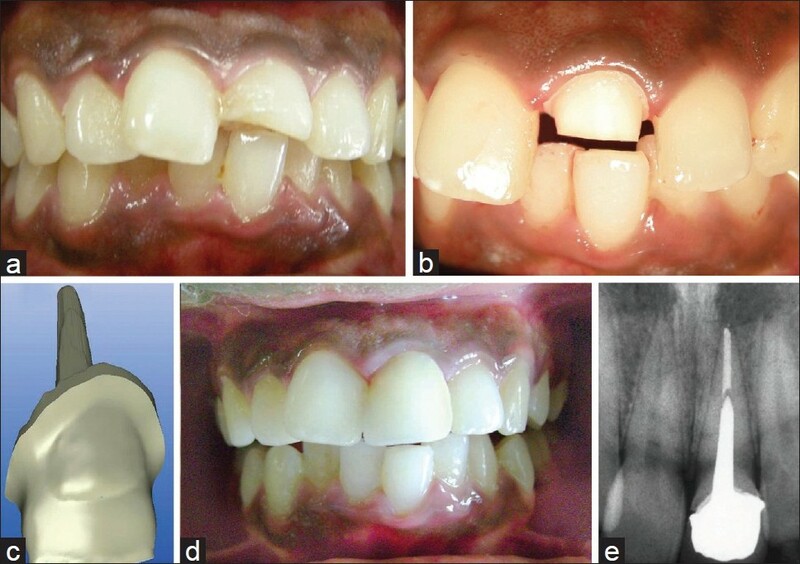 The clinical reports presented in this article take advantage of the aforementioned properties of ceramics to fabricate an all-ceramic foundation restoration and crown as a single-unit restoration. The superior mechanical properties and esthetics of zirconia made it a promising material for endodontic posts. Unification of the post and core as a single unit was first attempted by Schweiger et al. by waxing and heat pressing a glass ceramic core directly onto a prefabricated zirconia post. However, an interface still existed between the zirconia ceramic post and the glass ceramic core and therefore this treatment modality fell short of achieving a monobloc effect. A single-unit post-core-crown restoration fabricated entirely from high-strength zirconia ceramic has various advantages over its multiple unit counterparts. When the post and core are two separate entities, flexion of the post under functional forces stresses the post-core interface, resulting in separation of the core due to permanent deformation of post. Breakdown of the core eventually results in caries or dislodgement of crown. The different coefficients of thermal expansion of the various components also have a deleterious effect on the bonds between the tooth-post-core-cement-crown complex. The combined effects of thermal cycling, fatigue loading, and aqueous environment test the bond between materials and cause breakdown of the materials over a period of time. Therefore, it is desirable to unify the post, core, and crown in one material for long-term stability. By decreasing the number of interfaces between components, the single unit restoration helps to achieve a monobloc effect. Also, the CAD/CAM technique offers the advantage of reducing the chair side time by reducing the number of clinical procedures involved in fabrication. The CAD/CAM systems offer the advantage of automation of fabrication procedures with increased quality in a shorter period of time. , They are able to minimize inaccuracies and reduce hazards of infectious cross-contamination. The machinable zirconia ceramics are extremely suitable for the fabrication of restorations by CAD/CAM technique as they can be designed and milled in their soft presintered condition and subsequently sintered to achieve their physical benefits. Although the currently available CAD/CAM systems are not programmed for the fabrication of ceramic post-core restorations, the case reports presented in this article illustrate that modified all-ceramic Richmond crown can be fabricated quickly and precisely by using CAD/CAM technology. Appropriate case selection is, however, a paramount criterion for ensuring clinical success. This treatment modality is indicated for the management of severely compromised anterior teeth requiring post-core restorations where esthetics is a prime concern and there is reduced incisal clearance. Due to the higher cost of the all-ceramic restorations and the poor retrievability of ceramic posts, these restorations are indicated only in cases with good clinical prognosis and high esthetic value. Both cases presented in this report have been followed up over a period of 6 months with no evidence of fracture, debonding, or change in esthetic qualities. Long-term follow-up and longitudinal clinical studies will add to the credibility of this new restorative strategy. The all-ceramic single-unit post-core-crown restoration is a promising treatment modality for the esthetic restoration of severely damaged anterior teeth. The use of CAD/CAM technique for the construction of occlusal contact entirely in high-strength zirconia ceramic decreases the chance of failure of the restoration due to fracture while providing an anterior tooth restoration with excellent esthetic properties. 1. Schwartz RS, Robbins JW. Post placement and restoration of endodontically treated teeth: A literature review. J Endod 2004;30:289-301. 2. Koutayas SO, Kern M. All-ceramic post and cores: The state of the art. Quintessence Int 1999;30:383-92. 3. Christensen GJ. Why all ceramic crowns? J Am Dent Assoc 1997;128:1433-5. 4. Blatz MB. Long term clinical success of all-ceramic posterior restorations. Quintessence Int 2002;33:415-26. 5. Segal BS. Restorative assessment of 546 all ceramic anterior and posterior crowns in a general practice. J Prosthet Dent 2001;85:544-50. 6. Fradeani M, Redemagni M. An 11-year clinical evaluation of leucite reinforced glass ceramic crowns. Quintessence Int 2002;33:503-10. 7. Luthardt RG, Holzhüter M, Sandkuhl O, Herold V, Schnapp JD, Kuhlisch E, et al. Reliability and properties of ground Y-TZP zirconia ceramics. J Dent Res 2002;81:487-91. 8. Kwiatkowski S, Geller W. A preliminary consideration of the glass-ceramic dowel post and core. Int J Prosthodont 1989;2:51-5. 9. Tinschert J, Zwez D, Marx R, Anusavice KJ. Structural reliability of alumina, feldspar, leucite, mica and zirconia based ceramics. J Dent 2000;28:529-35. 10. Fernandes AS, Dessai GS. Factors affecting the fracture resistance of post-core reconstructed teeth: A review. Int J Prosthodont 2001;14:355-63. 11. Glossary of prosthodontic terms. J Prosthet Dent 2005;94:10-92. 12. Luthardt RG, Holzhüter MS, Rudolph H, Herold V, Walter MH. CAD/CAM machining effects on Y-TZP zirconia. Dent Mater 2004;20:655-62. 13. Barnfather KD, Brunton PA. Restoration of the upper dental arch using lava all-ceramic crown and bridgework. Br Dent J 2007;202:731-5. 14. Leempoel PJ, Eschen S, De Haan AF, Van't Hof MA. An evaluation of crowns and bridges in general dental practice. J Oral Rehabil 1985;12:515-28. 15. Neiva G, Yaman P, Dennison JB, Razzoog ME, Lang BR. Resistance of fracture of three all ceramic systems. J Esthet Dent 1998;10:60-6. 16. Kato H, Matsumura H, Tanaka T, Atsuta M. Bond strength and durability of porcelain bonding systems. J Prosthet Dent 1996;75:163-8. 17. Rosenblum MA, Schulman A. A review of all-ceramic restorations. J Am Dent Assoc 1997;128:297-307. 18. Evans AG, Heuer AH. Review-transformation toughening in ceramics: Martensitic transformation in crack-tip stress fields. J Am Ceram Soc 1980;63:241-8. 19. Christel P, Meunier A, Heller M, Torre JP, Peille CN. Mechanical properties and short term in vivo evaluation of yttrium-oxide-partially-stabilized zirconia. J Biomed Mater Res 1989;23:45-61. 20. Kosmac T, Oblac C, Jevnikar P, Funduk N, Marion L. The effect of surface grinding and sandblasting on flexural strength and reliability of Y-TZP zirconia ceramic. Dent Mater 1999;15:426-33. 21. Freedman G, Glassman G, Serota K. Endo-aesthetics. Part I. Intra-radicular rehabilitation. Ont Dent 1992;69:28-31. 22. Trushkowsky RD. Coronoradicular rehabilitation with a carbon-fiber post. Compend Contin Educ Dent Suppl 1996;20:S74-9. 23. Meyenburg KH, Luthy H, Scharer P. Zirconia posts: A new all ceramic concept for non vital abutment teeth. J Esthet Dent 1995;7:73-80. 24. Schweiger M, Frank M, Cramer von Clausbruch S, Holand W, Rheinberger V. Mechanical properties of a pressed ceramic core to a zirconia post. Quintessence Dent Technol 1998;21:71-7. 25. Libman WJ, Nicholls JI. Load fatigue of teeth restored with cast posts and core and complete crowns. Int J Prosthodont 1995;8:155-61. 26. Ahn SG, Sorensen JA. Comparison of mechanical properties of various post and core materials. J Korean Acad Prosthodon 2003;41:288-99.